This blog has been created to present details, documentation and information in relation to serious allegations of systematic discrimination, neglect, bias, victimisation, bullying and manipulation of test scores and documents formally made against the NSW Department of Education that we allege are part of a conspiracy to cover up. In order to show just how the new State Government is using the same process as the old Government I have set out below a copy of a letter that was sent to The Hon Adrian Piccoli MP, Minister for Education and attach a copy of the response. For over 7 years my family have waited for the Liberal party to come into power at State level so that they had the power to deal with matters brought to their attention in relation to State issues. Since early 2003 our family have been making formal and serious allegations against members of the NSW Department of Education (DET). These allegations involve serious breaches in Policy and Procedure and include allegations of systematic bias, bullying, victimisation, manipulation and tampering of State Records, breaches in Codes of Conduct and a conspiracy to cover up commencing in the Year 2000 and spanning many years and involving all of our four children and family. 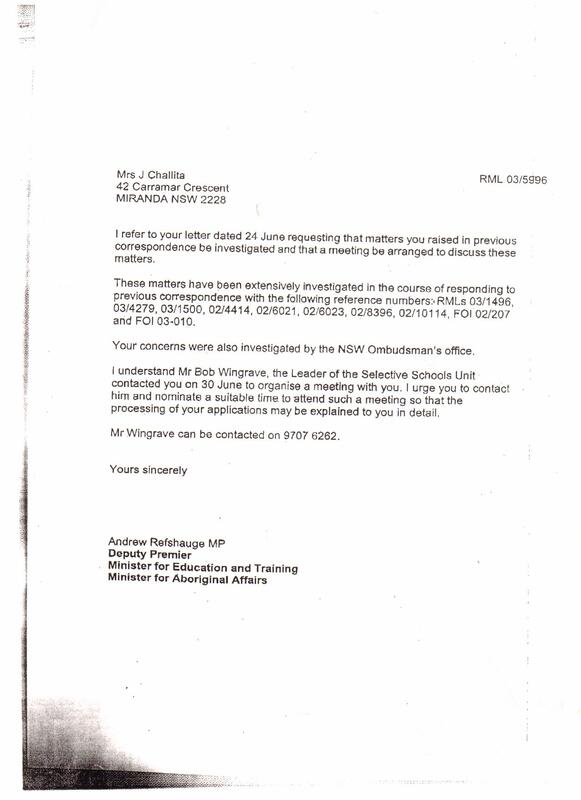 In August 2003 the then Minister for Education, Mr Refshauge, ordered an investigation into our families allegations – see letter attached 4 August 2003 . We received in 2006/07 under an FOI application copies of DET internal documents that showed written confirmation that stated that the Minister for Education promised an investigation but that no investigation has taken place – see attached 24.6.2004, 5.7.2004, 9.8.2004 , 13.8.2004. To date our formal and serious allegations have not been investigated as per policy and procedure require. Allegations of further bullying and victimisation aimed at our children made over subsequent years and requests to protect our children were also not investigated . In 2006/07 we received under FOI copies of internal documents/submissions that presented that the Minister for Education had deemed me ‘vexatious’ and had ordered that all correspondence from me be filed away without response. At no time were we advised of this directly by the Minister or by the DET. Documents produced under FOI show my name on the attached undated and unsigned list that is headed “List of regular correspondents to which acknowledgments/responses should not be sent” DET List undated. It is stated on this list that no response be sent in relation to ‘Selective Schooling for her children”. Under this umbrella serious and formal allegations of breaches in Policy and Procedure and the Code of Conduct were ignored and covered up. To date my name remains on that list and requests to have my name removed and my name cleared are ignored. All attempts by our family to remove this person whom we alleged was targeting and victimising our children and family from having anything to do with our complaints or anything to do with our children were ignored and instead the person was promoted within her Department to a position of even more power and given full responsibility for dealing with all matters to do with our family and children without supervision, question or challenge. This put children at risk of harm. The manner that this matter has been handled and dealt with has had a significant impact on our family’s health and wellbeing. We have clear evidence to support all of our family’s allegations and clear evidence that shows that the DET and Labor Government Departments have conspired to cover this matter up. There are people in positions of power in the Department of Education who are abusing their power and/or who are covering up for those who abuse their power and they need to be made to answer and held to account. Our children deserve at least that. I have over the years sought the assistance of Mr O’Farrell and other Liberal members in relation to these issues but as the Liberal party was in opposition I was told that their hands were tied and that they did not have the power or resources to deal with individual complaints. I have in my hand a contract provided by Mr O’Farrell that states that the Liberal Party will restore accountability and that asks that we ‘please keep this contract and by all means hold the Liberal Party to account”. I sent the following letter. We respectfully ask that given that the Liberal Party now has the power that you please question the DET in relation to our allegations and request from the DET the full report into the formal investigation as ordered by the Minister for Education Mr Refshauge and as is required to be conducted in accordance with the Departments Responding to Suggestions, Complaints and Allegations Policy so that this matter can be independently and properly and fairly addressed and dealt with and this injustice rectified and my family’s name cleared. For over 7 years our family have been denied procedural fairness and natural justice. We seek to have this matter properly and fairly resolved. I write in response to your letter of 7 April 2011, to the MInister for Education, regarding issues concerning your past dealings with the Department of Education and Communities. The Minister has asked me to respond on his behalf. Your letter and attachments have been carefully considered. All the matters you raised have been considered and responded to in the past. As there are no new issues, there is nothing further that can be added and your letter and attachments will be kept on file. We would be pleased to assist you with any new matters or concerns that you might want to raise. No acknowledgment or response was received the Minister, for sure if ever questioned the Minister will say he didn't know, no consideration was given to what we have presented and provided. The same process of just accepting the original advice (that came from the person accused and was a lie and that breached Policy and procedure as Policy and Procedure requires that allegations of this nature are FORMALLY INVESTIGATED not just responded to) and deeming the matter closed has been used. Procedural fairness and natural justice does not exist. In November 2008 I took the FOI Unit of the DET to the Administration Decision Tribunal in relation to the production of an Audit Report into the Selective Schools Unit. The DET had the Crown Solicitor represent them at the hearing. It wasn't an easy day for me as I am not a Solicitor but I did the best that I could. I had read in submissions previously produced under FOI about an Audit and how 32 recommendations had been made and so I requested the report under FOI so as to see whether the recomendations had been implimented as I was aware of serious issues in the Selective Schools Unit that included manipulation, misconduct and cover-ups. The DET refused to provide the report. I took the matter to the ADT. That was in November 2008. On the 14th July 2010 judgement was handed down. That was one year and 9 months (1yr 9mths) later. Then people wonder why matters take years to be dealt with. This type of delay isn't limited to the ADT. It is obvious that the long wait resulted in the Judiciary Member not quite rembering what happend on the day as it became obvious to all that the Audit oversight process is a joke and nothing actually gets looked at or into. They have a meeting and a report is tabled that states what Audits have been completed and the outcomes, then that is it - meeting is closed. It has become obvious to me that our Government has set up all these bodies, ADT, ICAC and the Ombudsman as a means of covering up their misconduct and corruption. It seems like it doesn't matter what state the Department of Education is in, they use the same process. Here is a story of a teacher who found a report in relation to asbestos in a Northern Territory school. The report was calling for the asbestos situation to be investigated. The teacher questioned what had been done about the report and as a result found themselves on the "Blacklist". Putting people on a "LIST" is how the DET controls complaints so as to not be able to be held to account. There has been a lot of interest lately in relation to Education staff being defamed on websites and being bullied and defamed by parents and students. In the interest of fairness I believe that some focus should also be placed on bullying and defamation by Education Staff directed at parents and/or students. As many of you know in early 2003 I had cause to make some formal complaints in relation my children's education and treatment by education staff and that amongst other things included the manner that their Opportunity Class and Selective High school applications were handled and dealt with. The allegations included allegations of bias, bullying, neglect, victimisation, vilification, and manipulation and tampering of state records. These issues came about following certain 'incidents' that occured that involved my children after I made some public and formal complaints about the neglect of the education of intellectually gifted children. Documents received under FOI showed clear evidence of bias, tampering and manipulation. As can be see on the post headed Process of Administrative Cover up http://jolandachallita.typepad.com/education/2009/08/the-process.html , the Minister for Education at the time, Mr. Refshauge ordered an investigation into our families allegations by way of a letter dated 6 August 2003. In his letter the Minister stated that an investigation would be commenced and I would be contacted in relation to the investigation. In January 2004 after receiving further evidence to support our allegations and, as we had still not been contacted in relation the investigation, I wrote a further letter to Mr. Refshauge. My letter was ignored. During this time I was unable to speak to anybody independant about my complaints or get any information in relation to where the investigation ordered by Mr. Refshauge was at. The fact that a formal investigation was promised and had not occurred was noted in emails and file notes produced under FOI including in internal emails from the Audit Director of the DET. After years of being ignored, messed about and further bullying, neglect and victimisation being aimed at our children and family I requested further documents under FOI. In these documents we found evidence that showed that the person against whom we had made the allegations against had presented since early 2004, in emails, Submissions and documents that I had been deemed vexatious and that the Minister had ordered that correspondence from me be filed away without response. This was a lie. This came as a complete shock to us as we had not received any notification that I had been deemed vexatious nor was I ever told by the Minister that my correspondence would be filed away. What I was told by the Minister for Education was that my allegations would be formally investigated and that I would be contacted in relation to the investigation. I requested under FOI evidence of the process used to deem me vexatious Email from P Cribb 13 Aug 07 . I was advised in March 2008 by letter from DET 25 March 2008 (see page 2 and 3) that I had never been deemed vexatious by the Minister or by the DET but that the Minister had put my name on a 'list' for which correspondence was not responded to DET List of correspondents to not respond - undated. I had never been told by the Minster that he had put my name on this list, on the contrary his letter to me stated that a formal investigation would be commenced and that I would be contacted in relation to the investigation. Documents produced under FOI show that the person against whom allegations had been made put my name on this list. It is also presented as fact in submissions and emails that I had been deemed vexatious and this lie was passed on as a fact internally by the person against whom allegations were made and has worked to defame me and discredit me and influenced how people viewed our complaint and had allowed for the complaint to be filed away without investigation - putting children at risk of harm. It was also stated in submissions that the allegations had been investigated and the DET's officers cleared of any misconduct. This statement was repeated many times and is not true. No investigation took place and I have clear evidence by way of internal file notes and emails that clearly states that the Minister for Education ordered an investigation but no investigation took place, instead the person whom we alleged was bullying, vilifying and victimising our family spread lies and just closed the complaint. Many would think that all I would have to do is to show people in positions of power the evidence but the problem is that nobody will actually look at the evidence and, as I have been put on a list by the person against whom allegations have been made, and my reputation has been ruined, my correspondence gets filed away. I have attempted to have the records Amended to reflect the truth but the DET refuses to amend the records and the Administrative Decisions Tribunal has indicated that they do not have the Jurisdiction to deal with the type of matters that we present ie- bias, corruption and fraud. I have attempted to see a Solicitor but they say that the DET has a bottom less pitt of money and that they will just drag it through the courts until they destroy you. I have tried local MP's and have been either ignored or told that they do not have the power or resources to help. I have tried the Ombudsman who just contacted the person whom we alleged is responsible and just accepted her lies, despite the evidence clearly not supporting what she says and refused to investigate the complaint. Even fresh allegations involving my other children are ignored. I tried ICAC who said that they have a lack of funding and resources and they only focus on matters that involve money. So lies remain on my file, my children endured years of neglect, bullying, victimisation, manipulation of their test scores and school applications, vilification, opression and humiliation. my reputation has been ruined, people think that the DET must have investigated because Policy says that they should it and I must be vexatious. The failure of the DET to deal properly and fairly with the complaint has worked to further discredit us as people believe that if there was any truth in anything that we say that something would have been done about it. LIttle do they know that bullies are protected in the DET and best interest of the child is not their concern. In Northern Ireland they are getting rid of 11 plus academic selection on the basis that the process is unfair, children are discriminated against, children are traumatised etc. For years I have been saying that Selective Schools selection process in Australia is not only grossly unfair it is also open to corruption and bias, prejudice and segregation. In this day and age all children should have access to higher learning opportunities during their school years. It isn't fair to limit access to higher learning opportunities to those who get the highest test marks as those children are generally already advantaged and have access to optimal learning environments. How can the disadvantaged compete? If we have equality in Education then access higher level and quality education should be available to each and every child with the only requirement being that they understand that they have an obligation to put in the effort and to appreciate what is being made available to them. Manipulation of complaints DET style. After years of fighting a cover up with the DET in relation to allegations of bias and manipulation today it hit me. The whole time this has been going on the Selective Schools Unit (SSU) has wanted me to focus on the tests and the test marks and they have done everything in their power to do that as that way the matter would go no further and they could close the matter and they wouldn't have to address the issue of what happened next. It worked because I was told by the Ombudsmans office that because I couldn't prove the test or school marks were manipulated in the first instance that they wouldn't investigate anything that happened after that. The SSU made sure that I couldn't prove manipulation in the first instance by destroying the original answer sheets. These answer sheets were destroyed on the day the matter was listed for planning meeting at the Administrative Decisions Tribunal with regard to access to these exact documents. I have emails produced under FOI by the DET organising the destruction of the answer sheets a few days prior to the planning meeting. When the fact that they destroyed the documents whilst under an FOI request being put before the Administrative Decisions Tribunal was presented to the ADT I was told that the DET couldn't produce documents that they didn't have and that the fact that they destroyed them whilst under and FOI application was outside their jurisdiction. The person we alleged was responsible for victimising our children closed the matter and meant that nobody would consider what happened next as the allegations of manipulation, bias and misconduct didn't just relate to the initial test marks they also related to every aspect of the Selective Schools process including the appeals process some examples are set out below. 1. Documents produced under FOI show that after the selection committees met and awarded my daughter a composite score of 232.19 see here and here Magda Pollack accessed my daughters results and changed the score, under the guise of an error in calculation, to a lower score of 214.26 so that she would not be successful for the school of her choice. That lower incorrectly calculated score was then presented to the Appeals panel for them to make their decision see here . We know that Magda Pollak changed the score because we received stuck to the letter advising of the test results a copy of a data file dated 4 September that showed the changing of the scores by Magda Pollak -see here . The legitimate data file produced under FOI and dated 17 Sept 02 shows the higher score of 232.19 as awarded by the Selection Committee not the lower score as changed by Magda Pollak see here . 2. The Selective Schools list register produced under FOI shows that the selection committee awarded my son a score of 213.33 see here this resulted in an offer for placement. The document also shows a hand written note in a bubble by Magda Pollak that says that my son was moved to the reserve due to an error in calculation. The data file shows two scores see here. One would imagine that it would be highly unlikely that two different selection committees on different days for two different identified very highly/exceptionally gifted children, for the same school year, would both calculate the children's scores incorrectly and they would both need to be changed to lower scores after the fact by the head of the Selective Schools Unit to make them unsuccessful for placements? 3. Documents produced under FOI also show that Magda Pollack didn't put my youngest daughters application before the Selection Committee despite saying in submissions that the Selection Committee determined the application instead she lied about the IQ test and the results of my daughters school reports so that my daughter would not be considered for placement and would loose her appeal. There are misrepresentations and evidence of manipulation, bias and misconduct throughout the whole process for all my children. This is only a snap shot of what has happened but at the end of the day the reality is that the DET have failed in their duty of care and breached their code of conduct and the complaint handling system and process designed by our Governments is designed to cover up and protect public servants and by extension or Government. That they can do that and get away with this is a concern and ensures that our children are not protected. If the Legal Officer of the DET calls it a Conspiracy - is it a conspiracy? I have been lucky in that I have bought a new scanner/copier and it is sitting right next to my computer. Previously I had to go upstairs to my daughter's study and bother her when I wanted to scan things and she had to do the process and then save it and then had to send it to me by email or I had to use her computer to post things so the whole process was difficult. Now I can just sit here and scan all the interesting emails that I have from the Department of Education and put them straight onto my blog. During the course of our families matter the Department of Education has tried to present me as paranoid about a conspiracy and of me having accused 'everybody' of being part of the conspiracy. They have said in submissions that "There is no conspiracy against my family". I can scan that submission if anybody wants to see it. However in the email below the Senior Legal Officer of the Legal Services Directorate of the Department of Education specifically refers to a conspiracy. She not only refers to a conspiracy she states that the correspondence has been delayed so that then the Crown Solicitor is also part of the conspiracy? From: Lee Rayer - TO: Magda Pollak - Sent 13 June 2006 9:48 a.m. Morning, I hope your weekend wasn't as bad as you thought it was going to be. I received a copy of correspondence that Chrisa Ludlow forwarded to Mrs Challita's solicitor which provided the documentation from your Unit and apologised for the delay and saying that it was caused by an oversight in the Crown Solicitors Office. So now Christa will be part of the conspiracy. Christa wanted me to thank you very much for your patience and tolerance as a witness in this matter. I want to also thank you for your professionalism in the face of great adversity. Let me know when you want me to look a the letter you are drafting about Amanda's application. Of course despite formal requests that Magda Pollak have nothing to do with my daughters matter and after having been advised that she had removed herself from the processing of the application etc, documents produced under FOI show that Magda Pollak was the one who was consulted and who was sent my daughters original test papers by ACER (the company that is supposed to mark the tests). The DET also marked Amanda's test instead of ACER, but presented it as though ACER marked it, and Magda Pollak was the one who was drafting all correspondence in relation to matters to do with my daughter - even from home on the weekends. This is despite the fact that formal allegations of bias, bullying, victimisation, neglect and manipulation of state records having been made against her and formal requests were made to keep her away from anything to do with my family or children. Further documents produced under FOI show that Magda lied about Amanda's IQ test results (the DET have agreed to make a notation/amend the records to that effect but that of course doesn't raise questions at the DET or in their eyes suggest wrongdoing), she lied about Amanda's application being put before the Selection Commitee, she lied about the results of my daughters school academic performance results and Amanda's application was never put before the Selection Commitees despite it being presented in letters and submissions as though the Selection Commitees were the ones who made the determination to not offer my daughter a place. The fact that Amanda was an accelerated student and young for her year was also not noted as required as this would have immediately flagged her application and meant that her application should have been put before the Selection Commitee for consideration. My daughter was culled by Magda Pollack and the Selection Commitee was not given the opportunity to consider her application. Because of the failure of the DET or Government to act on numerous formal complaints against Magda Pollak our children and family have been denied impartial and unbiased decisions - this was the 3rd of our children that Magda Pollak was allowed to bully, victmise, vilifiy and neglect and the 7th time she had done this to one of my children. We also know of other children who have similar documents produced under FOI and who were treated the same way. Instead of the allegations being investigated Magda Pollak was given our families matters and complaints to 'take care of' and she was promoted to the Leader of the Selective Schools Unit where she has control over all documents and everything to do with the process. Apparently nobody else in the DET knows how to identify a gifted child or knows how to do the process, or knows how to provide documents in relation to matters to do with the Selective High School process. It is with sadness that I read about the decision against Rajaratnam Premachandran in relation to allegations of defamation against a Primary School Principal. It is of no suprise that the newspapers present the story incorrectly, http://www.dailytelegraph.com.au/news/angry-dads-80k-defamation-bill/story-e6freuy9-1225794962835, this story was never about the students missing out on a Selective School place. The email complaining about the Principal and the education of the school was sent in April and the Selective School results didn't come until until July. This story is about a family trying to do the best for their bright children and being in despair at the failures of the public education system. The failure of the comprehensive school system to educate mainstream public school students to a level of competition against students who are in Private schools or who are tutored/coached or who are in Opportunity Class is extreme. The expressions used by Prem just represents his background and his somwhat limited grasp of the English culture/language - he certainly would do well to work on that but there was never any malice. This was an honest opinion based on experiences and the desire to provide for his daughters. To not be allowed to speak out about it to interested parties without having to pay compensation is a disgrace. This is an attack on our freedom of speech and in particular members of the Department of Education. Our Government continues to cover their own back. The last few decisions handed down in the Administrative Decisions Tribunal (see below) show just what sort of system we have . When the Government provides a Tribunal to hear matters of concerns with FOI but gives the Tribunal no direction, jurisdication or power to deal with matters of integrity that means we have a morally and legally flawed system and really - a farce. (b) to ensure that records held by the Government concerning the personal affairs of members of the public are not incomplete, incorrect, out of date or misleading. (c) by enabling each member of the public to apply for the amendment of such of the Government’s records concerning his or her personal affairs as are incomplete, incorrect, out of date or misleading. It gets to the stage that I don't know what to say. What I continue to expose concerns me. We have processes and systems set up by our Government that present like we have rights, openness, accountability and protection but in reality only those who break the law and who abuse have rights and are protected as the Courts and Tribunals have no power to challenge those who do the wrong thing. One would think that students seeking copies of their own test papers and results should be able to access them without having to request them under FOI and fight for years on end to see their legidimate results. One would think that people with concerns regarding processess and procedures should be able to have their concerns properly and fairly addressed and the Department in question should be obligated to provide them with the documentation to support what they say that they have done and have said has occurred. You would think that if formal serious allegations are made against an employee of bias, manipulation and tampering of state records that this person would be supervised or watched and not let loose with access to critical documents and papers pertaining to the matter year after year.. Recently in relation to one of our FOI applications we asked that Magda Pollak not be permitted to have anything to do with matters to do with my family and FOI as there are formal allegations of bias and misconduct against her that have never been addressed. We were told that only Magda Pollack has the ability to access and prepare documents in relation to matters of the Selective Schools Unit. It is a concern that only one person in the DET has the ability to deal with these matters because that allows for corruption and is not best practice. This one person has also been presented as the only person in the DET, and that includes the Selective Schools Unit and the Gifted and Talented Unit, who has the ability to identify a gifted child. Does that not sound to you like far to much power for one human being especially one with allegations of bias, bullying, victimisation, manipulation, neglect and misconduct made against them? I would like to take a minute to present to you evidence of 'the process' of covering up complaints that is used by the Administrators of our Government and their friends/work colleagues employed in investigatory bodies and positions. I have attached a scanned copy of a letter reference number RML 03/5996. This letter is dated 4 August 2003 and it refers to my letter to the Minister for Education dated 24 June 2003; it is addressed to me, it is on letterhead and it was signed by the Minister for Education at the time, Mr. Refshauge. In this letter it states that our families complaints and allegations would be dealt with in accordance with the Responding to Suggestions, Complaints & Allegations policy. This policy clearly states that allegations of the type and nature made by our family are to be subject to a formal investigation and that the negotiation procedure is not applicable. On the basis of this letter we believed that a formal investigation had been commenced into our complaints and allegations. I have attached a scanned copy of a draft letter with the same reference number as above RML 03/5996. This letter is a draft/copy, it is not on letter head, it is not dated and it is not signed but it has the exact same reference number as the letter that was sent to me on 4 August 2003 above. This draft copy of the letter is not a legitimate copy of the original letter from Mr Refshauge with reference RML 03/5996. The original letter says that our complaints will be investigated. This fabricated letter says that the complaints have already been investigated and not just by the DET but also by the Ombudsman as well. These are blatant lies. I have attached a copy of a scanned Email from John Murn to Chris Ballentine hand-dated 6.8.2004. This email clearly states that the Minister for Education promised an investigation into our allegations and that no investigation had been undertaken by the DET or by the Ombudsman. Despite the Audit Directorate of the DET being clearly told by John Murn that the earlier allegations made by my family had not been investigated, I received a letter from the Audit Directorate saying that our families fresh allegations of new instances of bias and victimisation would not be investigated as they were similar allegations to those that we had previously made and that these allegations had been investigated and closed. I sent the Ombudsman the letter-head signed version of RML 03/5996 and the DET sent him the draft version. I had never seen or received a copy of the version provided by the DET before being provided a copy by the Ombudsman. Guess which version the Ombudsman Mr. Bruce Barbour chose as the 'legitimate version of RML 03/5996 and that he used to support his decision to not investigate our fresh allegations of further instances of bullying and victimisation aimed at our children and family? I had also sent the Ombudsman a copy of the email from John Murn dated 6 August 2004 as well as other evidence to support our allegations. It seems that it doesn't matter how much evidence you have nobody actually looks at it they just accept whatever they are told by their own. Of course the person whom they wanted me to see to explain 'the process' was one of the main persons implicated in this matter and against whom formal allegations of bias, bullying and victimisation had been made. This person had already told me previously when I asked for a Solicitor to be present at any meeting that he would only see me personally in relation to the matter and that it didn't matter whether I found his excuses reasonable or even acceptable that the matter would be closed and correspondence from me filed without acknowledgment. I wrote a letter of complaint to the Minster and my letter was not responded to. This is an administrative cover up. If this type of mis-conduct isn't a problem for our system then I do not know what is! Our investigatory bodies are not required to identify fabricated and/or altered documents nor do they want to properly and fairly investigate complaints and the system lacks impartiality and integrity to the extreme. For the record: Despite it being presented since 2004 in numerous internal DET documents as a fact, I have never been deemed vexatious or advised that I have been formally deemed vexatious etc by the Minister or DET. In 2007, after requesting evidence of the process used to deem me vexatious I received a signed letter from the FOI Unit dated December 2008 that clearly states that I have not ever been deemed vexatious by the Minister or the DET. This was another fabricated story spread by the persons against whom allegations were made so as to discredit me so that our allegations would be ignored. Despite having the evidence that clearly shows that I have not been deemed vexatious and substantial evidence that shows that the allegations have never been investigated my family can find no avenue to get our name of the list that we have been placed on that ensures that our correspondence is filed away and our family can find no avenue to hold the DET to account and force the Government to investigate the allegations that have been made against the DET. This is despite the fact that the allegations are serious and involve children. It upsets me to no end to read that they presented me as a mother who was harming my children when it was them who were neglecting, targeting, bullying and harming them. All I did was request documents under FOI and make written complaints to try to get protection and justice for my children. If making complaints was causing my children to be at risk of harm then this harm would be happening because of them and that is victimsation and is against the law. I came across a very interesting website whilst having my daily read through the Bad Apple Bullies website http://www.badapplebullies.com/teacherstories.htm. The Bad Apple Bullies website is a website for teachers who have been bullied and/or victimised by Departmental and or Government staff. Just like this website, these websites challenge the integrity of the Education System and complaint handling processes and procedures. Just like our families situation these teachers have had to resort to publicly airing thier concerns/allegations as they have been denied procedural fairness and natural justice. It seems that it doesn't matter whether you are a teacher or a parent if you bring up concerns in relation to the DET you will be dealt with and the system will ensure you pay a price. I would like to publicly support these teachers in their quest for justice. They deserve to be treated fairly and with respect. A matter is before the Courts where a Public School Principal is suing a fellow parent for defamation. The Parent, after being unable to get any satisfaction on important educational issues that he raised with the Principal, sent an email to some fellow class parentsl In the email he outlined his concerns about the ability and integrity of the Principal and put it out there that the principal should be removed from her position as she was failing in her duty of care to the children. He sent a copy to the Principal herself. He was very upset and felt very strongly about what he wrote. In return the Principal is suing him for defamation. The matter is before the Supreme Court this week. You have to wonder how it has been that this matter has been permitted to get this far? If the Courts award damages to the Principal it is will set a very dangerous precedent where parents will be unable to voice their concerns without risking being sued for defamation - even if their concerns are valid and true. This could seriously impact our freedom of speech! INVESTIGATION OF DET PROCESS AND PROCEDURES!